KNOXVILLE, Tenn. – Tennessee prepares to welcome No. 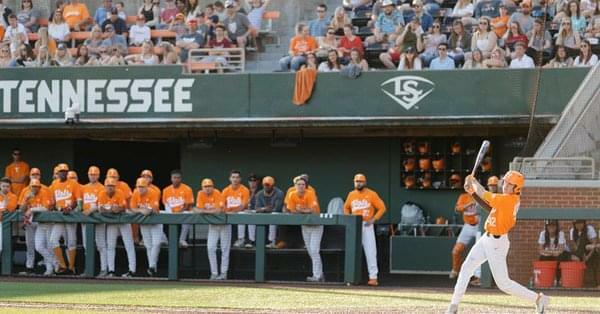 2 Georgia for another highly-touted SEC series at Lindsey Nelson Stadium starting on Thursday night. The Vols are coming off a win over Lipscomb where they hit a program-record tying seven home runs. This week’s series will be the third straight for UT against an opponent ranked in the top five nationally. Thursday’s series opener will be televised on the SEC Network with Dave Neal (PxP) and Mike Rooney (Color) calling the action. Friday and Saturday’s games will be streamed online via SEC Network+ and the WatchESPN app with Michael Wottreng (PxP) and Rusty Ensor (Color) on the call. John Wilkerson and Vince Ferrara will also call all three games on the Vol Radio Network (FM 99.1 / AM 990) as well as UTSports.com and the UT Gameday App. The 236 all-time meetings against the Bulldogs are the fourth most against any opponent for the Vols. Tennessee earned its second win over a top-five team in the span of a week last Saturday with a 2-1 victory over No. 5 Mississippi State. Andre Lipcius and Alerick Soularie both had four-hit games over the weekend against Mississippi State. Lipcius went 4-for-5 in the series opener, tying a career high in hits, while Soularie was a perfect 4-for-4 in Sunday’s series finale to set a new career high in base knocks. Soularie has been sensational in his debut season for the Orange and White. The sophomore leads the SEC in slugging percentage (.750) and on-base percentage (.513) and is second in the league with a team-best .406 batting average. The Houston native has reached base in 26 consecutive games and has recorded at least one hit in 18 of his last 21 games played. 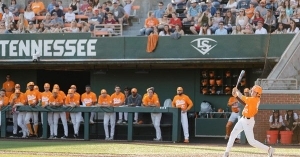 The Vols blasted seven home runs en route to a victory over Lipscomb on Tuesday evening. The only other time Tennessee hit seven home runs in a game was on March 7, 1980 against Tennessee Tech. Zach Daniels, Lipcius and Soularie went back-to-back-to-back in the first inning, marking the first time Tennessee has done that since April 3, 1996 versus ETSU. Tennessee has scored at least one run in the first inning in nine of its last 10 games. The Vols have scored in the first inning 16 total times this season. Georgia was picked to finish third in the Eastern Division in the SEC Preseason Coaches’ Poll after a breakout season in 2018. The Bulldogs are coached by Scott Stricklin, who is in his sixth year with the program and led UGA to its first NCAA Tournament appearance since 2011 last season. Georgia enters this week’s series with the best record in league play at 9-3 after taking two of three games last weekend at home against Vanderbilt. The Dawgs feature one of the nation’s top pitching staffs, ranking sixth in the nation with a 2.83 team ERA and second nationally with a 1.07 WHIP. Their weekend rotation boasts a combined record of 14-2. Game one starter Emerson Hancock is 6-1 on the year leads the SEC with a 1.02 ERA and .139 opponent batting average. He is also tied for 10th in the conference with 57 strikeouts. UGA has a balanced offense that features seven players with 15 or more RBI. Two-way player Aaron Schunk leads the SEC with 10 saves while also batting .323 with five homers and 26 RBI. Riley King is one of three players batting over .300 and leads the team with 32 RBI. LJ Talley leads the team with a .377 bating average and Tucker Maxwell ranks first on the team with seven home runs. Tennessee Relays Weekday Work Perk: Attend the Tennessee Relays at Tom Black Tack and receive a free admission voucher to Thursday’s baseball game. Student Giveaway: First 100 students receive an orange Vols replica jersey t-shirt. First Pitch: Tennessee Athletic Director Phillip Fulmer will throw the ceremonial first pitch. Big Orange Friday: Buy one general admission ticket, get one general admission ticket FREE! Print your Big Orange Friday voucher HERE(PDF) and be sure to wear ORANGE to the game. Fan Giveaway: First 150 fans receive a free Tennessee Mojo fedora hat. Student Giveaway: First 100 students receive a free Chick-fil-A sandwich. DJ Sterl the Pearl: Will play on the plaza during pregame. First Pitch: Head football coach Jeremy Pruitt will throw the ceremonial first pitch. Kids Day: All kids 12 and under receive free admission. Run the bases and get postgame autographs from select players (Weather Permitting). Baseball Bingo: Pick up your Bingo card at the Fan HQ Tent located on the plaza. The Vols wrap up their nine-game homestand with a Tuesday midweek matchup against Morehead State on April 16 at 6 p.m. The game will be streamed live online via SEC Network+ and the WatchESPN App.